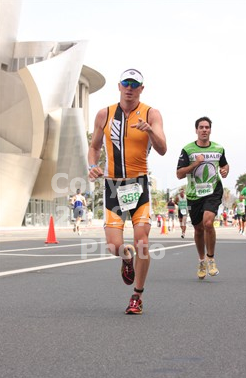 I was able to race the Kaiser Permanente Los Angeles Triathlon presented by Herbalife. I should rephrase that. I participated in the race this weekend. Checking the results, I was not too disappointed. The only thing that I have to blame is my lack of fitness. My guess is that it might be a direct result of the lack of training. I did swim with Courtenay a couple of weeks ago, but apparently that didn’t carry over to this race. I felt like my arms weren’t pulling me through the water, but were just going through the motions. There was a little swell and plenty of people had some difficulty. I hate when people complain about conditions in the ocean. If you are scared, don’t enter a race in the ocean. Know what you are signing up for. There were plenty of lifeguards and I never felt like it was too dangerous. 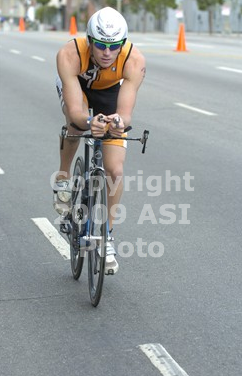 I was able to catch a couple of waves in at the end of the swim so that must have saved me about 4 seconds. The bike wasn’t as exciting as I thought that it would be. I love racing in cities where everything is shut down. There were lots of volunteers, cops everywhere, and the plenty of people wondering what was going on when they woke up Sunday morning. We rode through Korea Town and ended near the Staples Center. My legs felt constantly tired and I am hoping that it was uphill most of the way. After all, we were heading away from the ocean. It looked pretty flat however. The run was great. Except for one big hill. Up was bad, down was scary. I loved the run though. I never felt like I had any “pep” out there. I felt very flat the whole day. Like I was just going through the motions. I liked the run course because we got to run past a Disney building that I saw in the movie “The Soloist”. It was also fun because it was pretty close to an out and back and we did two loops. I like out and back courses. There is something that makes me happy when I know that I am on my way back. After the first half, everything seems easier, no matter what the distance is. I was glad that I got to do the race. We left LA a couple of days later and now I am sitting in the Honolulu airport. When I publish this, I plan on being on my lanai looking over the warm part of the Pacific thinking about how hectic this next week will be and how happy I am that I am not racing. I look forward to a full week with a few thousand friends. 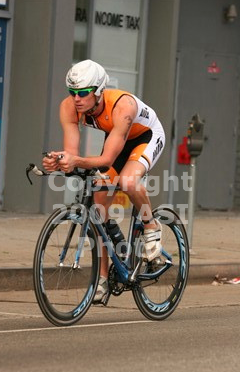 This entry was posted in bike, race, run, swim, triathlon, vacation, work by Rory. Bookmark the permalink.